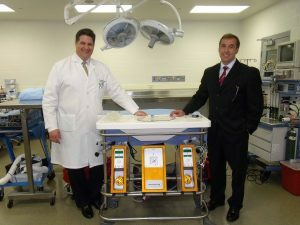 The McGowan Institute for Regenerative Medicine congratulates deputy director Paulo Fontes, MD, Professor of Surgery in the Department of Surgery and director of the Machine Perfusion Program, a collaborative effort between the Starzl Transplantation Institute, Department of Surgery, and the McGowan Institute, on his award of $50,000 from the Coulter@Pitt TPII Program, the Center for Medical Innovation (CMI), and the University of Pittsburgh and UPMC Liver Center for a full year starting July 1, 2017 and ending June 30, 2018. Dr. Fontes is the Co-PI of this study. Dr. Fontes and PI Christopher Hughes, MD, Associate Professor of Surgery at Pitt, demonstrated to the program’s Oversight Committee (OC) that OrganEvac satisfies a large unmet clinical need and that, in the OC’s judgement, there is likely a viable path to commercialization. The Coulter Program’s mission is to help translate promising technologies to clinical practice through commercial products, with the goal of improving healthcare and patient outcomes. To do so requires tremendous effort on the part of the innovators and subsequent business teams to address the challenges of product development, clinical trials, regulatory approvals, raising capital, and a myriad of marketing and economic issues.